COMMENTARY ON "The Road to Faith"
"Without the law, we would have no gospel. It’s hard, really, to understand the gospel without the law." Of course, within Adventism, reference to "law" means law that is centered around the 'Ten Commandments' which is only a part of the Mosaic Old Covenant law. It needs to be stressed that Paul quickly outlines both his theme and his authority for defending the Biblical gospel. Only then does he develop his theme, word by word and line by line, in an orderly expository manor building concept upon concept. Paul does not confuse the development of his presentation by jumping around, back and forth from verse to verse as the lesson author does in the lessons for this week. Paul's theme found within Galatians chapter three really began with quarterly lesson's week five and six where our train of thought is also forced to jump 'all over the map' instead of making these lessons an orderly presentation of the epistle of Galatians. Obviously the quarterly lesson author's goal is to 'guide' the student into believing Adventist theology rather than simply letting Paul's text develop contextually through the guiding of the Holy Spirit. • There would be a new covenant unlike the old covenant. On the night Jesus was betrayed he announced the beginning of this covenant. This means that Jesus replaced the old covenant along with the law contained within it at Calvary. • The old covenant is a broken covenant, meaning it must be replaced. The covenant, the whole covenant would be gone. That literally means all the laws recorded in the first five books of the Old Testament of the Bible have been replaced with another kind of law. • The broken Mosaic old covenant shows us that without the faith of Abraham it is impossible to please God. Therefore it is important to understand that Abraham's faith was the founded upon the certain knowledge that he could do nothing to help God do what only God could do. • In the new covenant God's law is 'another kind of law' which Jeremiah declared would be written on his people's hearts instead of recorded in a book. There will come a time when the Hebrew people as a nation will accept Jesus as their promised Messiah thereby fulfilling this part of Jeremiah's prophecy. • On the night of the Lord's supper, the very day he was betrayed and crucified, Jesus announced the fulfillment and beginning of Jeremiah's New Covenant prophecy, thereby perfectly fulfilling at Calvary the requirements of the Old Covenant, meaning all the written law it contained. • Christians, Jew and Gentile alike, are free from the "law of sin and death" which was the law, the whole law, of the obsolete Old Covenant. There will come a time when God's law will be written on the hearts of the Hebrew people instead of being recorded in a book. • Paul was referring to something infinitely more significant we are free of than just 'ceremonial law' when he speaks of "the law of sin and death". Paul's point is, you cannot return to practicing the works of the Old Covenant law and still be placing your faith in the works of Jesus Christ who alone perfectly and completely fulfilled the requirements of the Old Covenant law. This is what you must understand before you can grasp the meaning of what Paul teaches in chapter three. The lesson author's claim that "Without the law, we would have no gospel" is incompatible with Paul's presentation of Justification by faith alone founded upon the works of Jesus alone. The gospel is centered solely on the death, burial and resurrection of Jesus Christ for the atonement of the sins of the world. Jesus' shed blood and nothing else. The lesson for today is centered on Gal. 3:21. "Sensing that his comments might lead his opponents to conclude he had a disparaging view of the law or that his comments about the priority of God’s promises were just a veiled put-down of Moses and the torah...."
"Though the law cannot save us, what great benefits does our adherence to it have for us? That is, what practical good have you experienced in your own life through obedience to God’s law?" Since Paul's book of Romans is a more in depth exposition of the theme than what is presented here in Galatians we will first turn there. In Romans chapter seven where Paul is specifically addressing Jewish Christians, Rom. 7:1, when he says; "Or do you not know, brothers—for I am speaking to those who know the law". Continuing on through to verses 6. Paul makes it clear that these Jewish Christian brothers "have died to the law through the body of Christ" because when one party in a covenant dies the other party is free from the binding conditions (the "law") of the covenant. If you happen to be a Jewish Christians you are free from this covenant, all the covenant, not just certain limited requirements of the covenant. Furthermore, Gentiles were never included in this covenant that God only made between himself and the Hebrew people. It is important to notice and understand that it is the Old Covenant and not just certain suppose laws (also known as the conditions of the covenant) that is now obsolete because of Jesus' atoning death at Calvary. There are no longer any benefits for adhering to the law contained in the Old Covenant. Our faith, the same faith as Abraham's, is founded upon the promise that the coming Messiah would come through his line of a son, Isaac, whose mother was Sarah, Romans 4 & Gen. 17. For those who claims this is an advocation of lawlessness we must understand that the very opposite is true. In Eph. 2:1-10 we learn that instead of sinning, our salvation in Jesus Christ leads to true good works. It is a question of sequence. Eternal salvation comes first which then produces true good works centered on the Jesus' gift of the indwelling Holy Spirit, Rom. 8:1-11. Paul established, both in Romans and in Galatians, that the old covenant law is obsolete because it is a part of a covenant that is broken and therefore has been replaced. Obedience to the Old Covenant law could not and never was intended to produce righteousness. But the Scripture (the law) imprisoned everything under sin, so that the promise by faith in Jesus Christ might be given to those who believe. The promise God made to Abraham came 430 years prior to the giving of the covenant, a covenant that had both a beginning and an ending. Therefore the conditions, the laws, of this conditional covenant are secondary to the eternal unconditional promise made to Abraham and fulfilled by Jesus Christ at Calvary. Instead of obedience to the law (man's failed works), faith in the atoning gospel of Jesus' death, burial and resurrection at Calvary (Jesus' perfect complete work) is the true one and only gospel that leads to righteousness and eternal life. 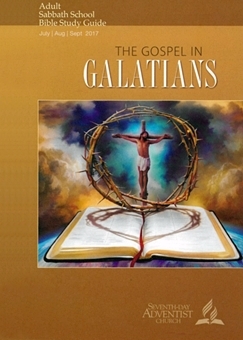 Monday, Aug. 7: "Kept Under Law"
"In Galatians 3:23, Paul writes that “before faith came, we were kept under the law.” "
The lesson is correct when is says that "the faith" in Gal. 3:23 "is most likely a reference to Jesus Himself" but fails to arrive at the orthodox understand that our Christian faith points back to Abraham's faith in God's unconditional promise of the coming Messiah fulfilled by Jesus Christ. The law "was" the guardian for the Hebrew people but is no longer a guardian. For Gentiles it never was so because they never were under the Old Covenant. For Jew and Gentile alike, faith is the 'faith of Abraham' that pointed forward to the work of atonement Jesus completed at Calvary. Obedience to the law of the Old Covenant is not and never was a 'way of salvation'. Salvation is and always has been faith placed solely upon the promises and work of God. Tuesday, Aug. 8: The Law as Our "Guard"
The lesson begins well by saying "the law does not nullify or abolish God’s promise made to Abraham" but then muddles the issue by introducing questionable secondary issues and by not asking one obvious question; What were the transgressions of the Hebrew people that led to the giving of the law which came long after God's unconditional promise he made to Abraham? Since God is truth and does not lie, God's unconditional promise he made to Abraham is eternal and cannot be altered by the subsequent actions of others. What Scripture teaches is that when your faith is placed upon the Gospel of Jesus shed blood at Calvary, you have already entered into God's eternal rest. What Paul means when he says; "until the offspring should come" is that the law no longer has a place in our rest because Jesus is our rest. “In this Scripture [Gal. 3:24], the Holy Spirit through the apostle is speaking especially of the moral law. The law reveals sin to us, and causes us to feel our need of Christ and to flee unto Him for pardon and peace by exercising repentance toward God and faith toward our Lord Jesus Christ.”—Ellen G. White, Selected Messages, book 1, p. 234. The whole law was one law within the Old Covenant Jesus replaced by his shed blood. There is no justification for mentioning 'moral law' separately from the whole of the Old Covenant law. The Apostle Paul does not make special mention of moral law. To him and any other orthodox Jew all the law was one law of the Old Covenant. "Many have interpreted Paul’s comment in Galatians 3:25 as a complete dismissal of the law. This makes little sense, however, in light of Paul’s positive comments about the law elsewhere in the Bible." The Apostles Paul said what he said and means exactly what he said. To argue with assumed logic and say "This makes little sense" is proof of nothing. Paul, speaking as the Jew he is, clearly says the Mosaic law no longer has any place in the lives of the people of God because it is no longer our taskmaster. Paul assures us that the law served a purpose, that purpose being to show what sin is and that all sinners fail to keep the law perfectly. Adherence to the law of the Mosaic covenant instead of having 'the faith of Abraham' is a legal arrangement wherein all who do so fail because all sinners are born dead of their spirit. Only Jesus, the eternal Son of God, born sinless when the Holy Spirit came upon Mary could and did keep the provisions of the Mosaic Covenant as recorded in Leviticus chapter sixteen. Through our faith in Jesus' shed blood we are instantly transferred by Jesus out of the kingdom of darkness and into the kingdom of God through the regeneration of our dead human spirit. Jesus is our justification. Through Jesus' gift of the indwelling Holy Spirit we now grow in sanctification while still living in this sin filled world. All our works that are acceptable in the sight of God are really the works of Jesus through the working of his gift of the Holy Spirit. The sure hope of all forgiven sinners is in the return of our Lord and Savior Jesus Christ. Only then will we be given our promised eternally glorified bodies living and praising God in a world free of sin and death. The Mosaic law served its purpose as a taskmaster when Jesus shed his blood at Calvary and now has no place in the lives of the people of God. “I am asked concerning the law in Galatians. What law is the schoolmaster to bring us to Christ? I answer: Both the ceremonial and the moral code of ten commandments. ..."
Yes the old covenant law was once "the schoolmaster to bring us to Christ" yet what Ellen White goes on to say is false. Scripture does not separate the old covenant law into "the ceremonial and the moral code of ten commandments" as claimed by Ellen White. This law was a single whole law regardless of how anyone may wish to break it into categories. All these laws were part of a broken covenant having been made obsolete by the new covenant. The whole old covenant law was given to point sinners to their need of Christ. As a custodian, it provided instruction about God and protection from evil. But like a disciplinarian, it also pointed out our sinfulness and brought condemnation. Christ frees us from the old covenant law’s condemnation and in its place writes His new covenant law upon our hearts. Copyright 2017 BibleStudiesForAdventists.com. All rights reserved. Revised August 1, 2017. This website is published by Life Assurance Ministries, Camp Verde, Arizona, USA, the publisher of Proclamation! Magazine. Contact email: BibleStudiesForAdventists@gmail.com.